Laura Loomer, who operated as an anti-Muslim online activist before she was suspended permanently from Twitter, was duped by internet pranksters into believing that her suspension occurred due to alleged lobbying by the Council on American-Islamic Relations (CAIR), a Muslim civil rights group in America. Loomer then apparently took that claim to The Wall Street Journal, which by conflating Twitter’s normal complaint mechanisms with the advisory capacity enjoyed by some advocacy groups with social media platforms, helped to advance the false narrative that CAIR was the power behind Loomer’s ouster from the Twittersphere—despite denials by both CAIR and Twitter that any meetings or lobbying for Loomer’s suspension had taken place between the two entities. In a long-form report on the involvement of advocacy groups on advisory panels to social media companies, Journal reporters Kirsten Grind and John D. McKinnon appear to have represented a user complaint made against Loomer through CAIR employees’ Twitter accounts as evidence of the group’s influence over Twitter executives when they decided to shut down Loomer’s account. Following her tenure with James O’Keefe’s Project Veritas operation, Loomer first gained internet fame in pro-Trump circles by disrupting a 2017 New York City production of Shakespeare’s “Julius Caesar” that depicted the story’s title character, who is dramatically stabbed to death in the middle of the play, costumed as a parody of President Donald Trump. 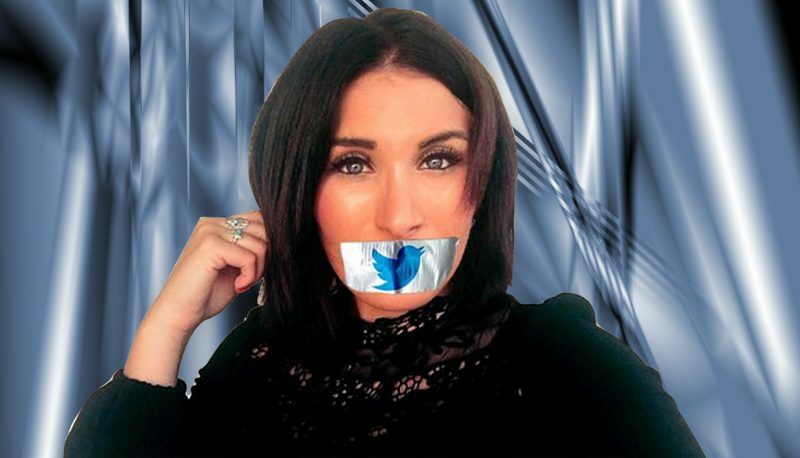 Loomer had gathered more than a quarter-million Twitter followers before she was suspended from the social media platform late last year after multiple violations of Twitter’s community guidelines against hate speech, including posts in which she targeted Muslims. Since then, she has gained brief flashes of viral attention when she handcuffed herself to a door at Twitter’s New York City offices in November to protest her suspension and when she hopped a fence yesterday at House Speaker Nancy Pelosi’s California home. After Loomer’s handcuffing stunt, Nathan Bernard and his associates, who say they seek to rile up and expose right-wing figures through a media operation they’ve dubbed “Bernard Media,” got to work devising a prank in which they would pose as a Twitter employee named Brad and seek to convince Loomer that “Brad” could help get her account reinstated. As the prank wore on and Loomer continued communicating with Bernard and his friends, they devised a plan to see how hard it would be to play off her anti-Muslim attitudes and convince her that Muslim groups were directly responsible for her suspension. Since December, Bernard and his friends exchanged hundreds of text messages with Loomer and spoke with her on the phone for nearly a half-hour, a conversation in which they offered deadpan confirmations of all conspiracy theories Loomer suggested to them about Muslim groups’ responsibility for her suspension. They even sent her a fabricated appointment calendar they said showed Twitter CEO Jack Dorsey’s schedule, and it included a notation for a meeting with CAIR on a date just days before Loomer’s suspension from the platform. When the Wall Street Journal published a story last week in which reporters repeated Loomer’s claims about what she said was CAIR’s role in her Twitter suspension, Bernard and his associates shared details of their prank with Right Wing Watch. 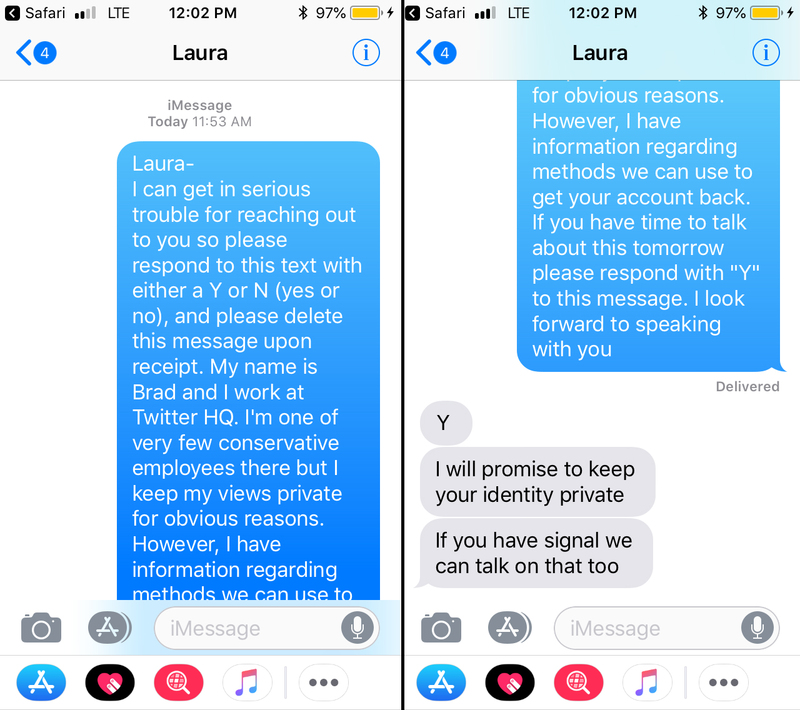 Chris Gillen reaches out to Laura Loomer purporting to be a Twitter employee named “Brad” who offered to help Loomer get her Twitter account restored. The Wall Street Journal published a story on January 8 about Facebook’s and Twitter’s conversations with political advocates regarding the moderation of political discourse on their respective social media platforms. (The story appeared in the January 9 edition of the print paper.) In the story, the authors reported that Loomer had learned that “outside groups and individuals had privately lobbied Twitter executives” to have her removed from the platform. The story does not state from what sources Loomer had gleaned that purported bit of intelligence, nor does it offer corroborating evidence of her claim. Noting that other groups had voiced similar complaints about Loomer, the Journal reporters wrote that they had confirmed with CAIR Executive Director Zahra Billoo that she had complained about Loomer’s presence on the website before, but failed to state the means by which Billoo said she had made her complaint: the mechanisms for such complaints that Twitter provides to every user. Twitter spokesperson Brandon Borrman told the Wall Street Journal that Loomer’s suspension “was the result of multiple, repeated violations of the same rules,” adding that “it was not about any one tweet.” A number of individuals and groups had complained about Loomer’s account, he told the paper. Other organizations, including the civil-rights organization Muslim Advocates, voiced similar complaints. 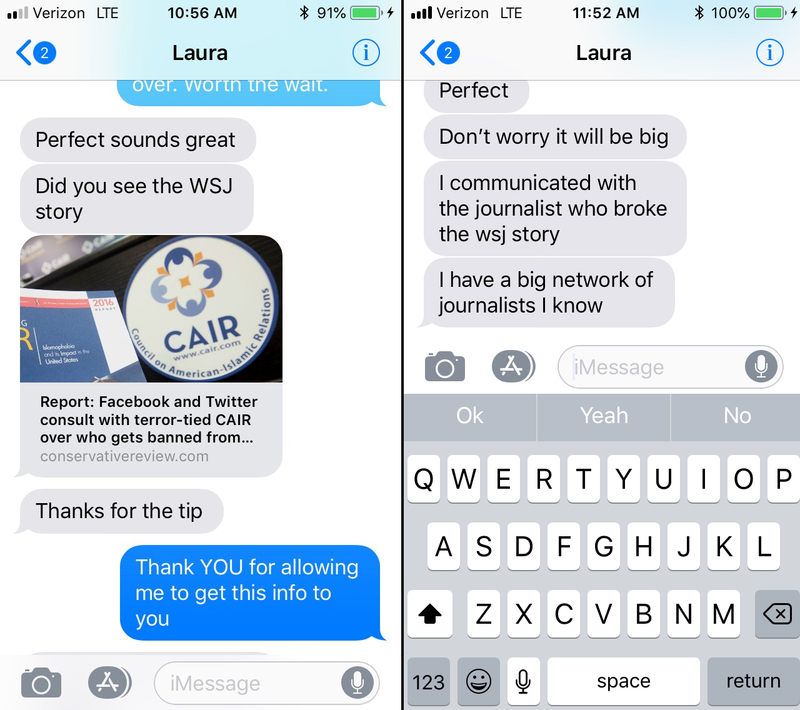 After the Wall Street Journal story ran, Loomer sent an article to the team of pranksters, thanking them for the “tip” about CAIR. The Wall Street Journal reporters who authored the story declined to provide comment to Right Wing Watch. Loomer did not answer an email inquiry or a text message inquiry for this story. Soon, stories portraying CAIR as the muscle behind Loomer’s Twitter ban overtook the right-wing corners of the internet. 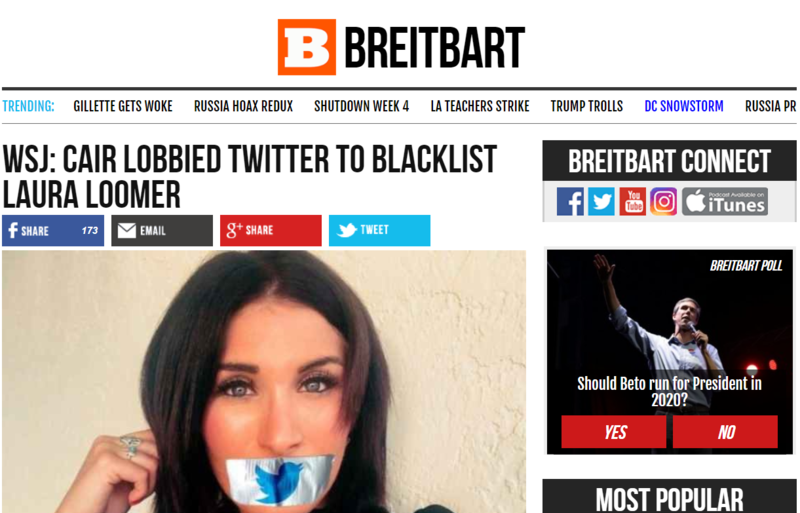 The Wall Street Journal’s reporting on Loomer’s suspension was repackaged by conservative news websites, including Breitbart, Conservative Review, Twitchy, The Gateway Pundit, and Big League Politics. Prominent right-wing publications and Twitter users, including Jacob Wohl and Jack Posobiec, cited the Wall Street Journal’s reporting to further their ongoing claims that conservatives face disproportionate moderation, or even censorship, on major tech platforms, and that prominent pro-Muslim groups are pulling the strings. Right Wing Watch spoke with Billoo, the CAIR leader whom the Wall Street Journal reporters cite in their article. Billoo said that some CAIR staff and leaders, including her, had reported Loomer’s tweets using Twitter’s built-in reporting mechanisms on their personal accounts. She denied that CAIR had lobbied Twitter executives and added that CAIR had not orchestrated any national action campaigns regarding Loomer’s Twitter presence. Billoo told us that she tried to clarify to the Wall Street Journal that CAIR’s role in Loomer’s suspension was limited to utilizing the platform’s built-in reporting features and that the publication’s reporters reassured her that she had been heard clearly. However, that information was not conveyed in their story. 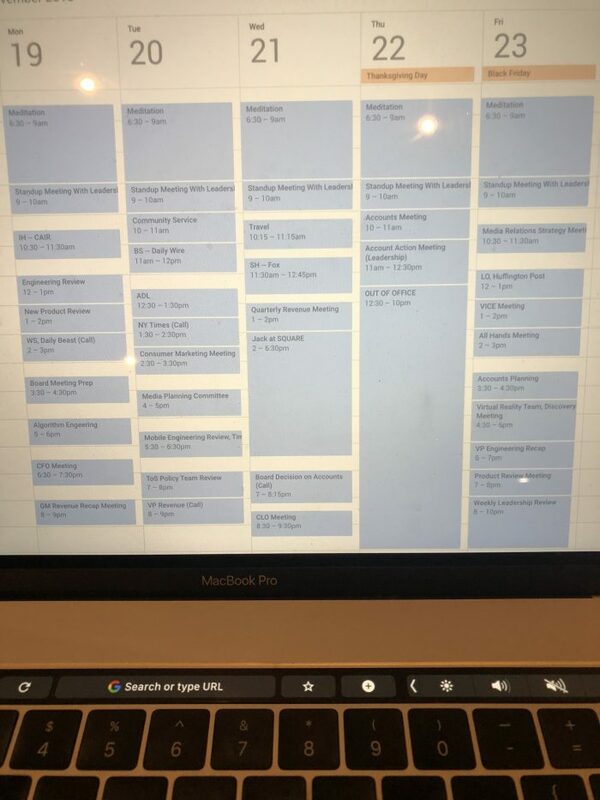 Nathan Bernard created and photographed this fake Google Calendar, which Chris Gillen sent to Laura Loomer and claimed displayed Twitter CEO Jack Dorsey’s schedule. A Twitter spokesperson told Right Wing Watch via phone that an internal investigation found that no senior executives at the company had records or recollections of meeting with CAIR representatives. “None of our senior executives have met with CAIR. As we told the Journal, we do meet and work with many outside groups, but they do not dictate our policy enforcement decisions. We take action when our rules are violated,” the spokesperson said. Bernard takes the fact that Twitter says it reviewed calendars looking for a meeting with CAIR in the wake of the Wall Street Journal’s report as proof that the outlet attempted to fact-check information that only he and his pranksters provided to Loomer. 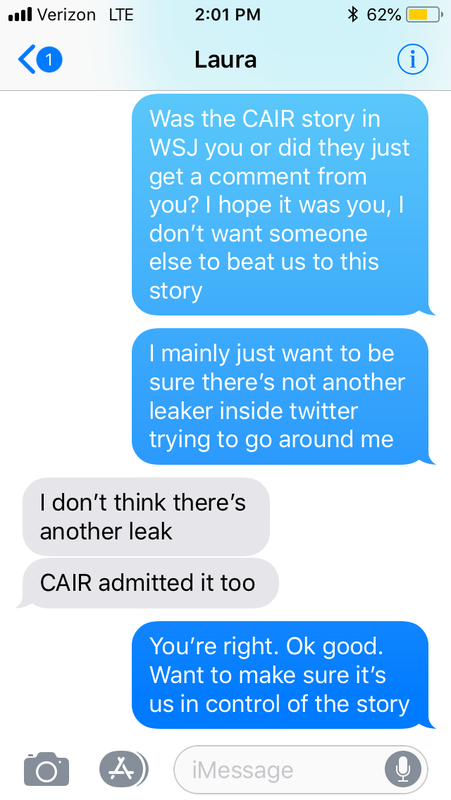 In a text message sent to Gillen’s “Brad” character after the WSJ article ran, Loomer told Gillen that she didn’t think there was another leaker inside Twitter. In a text message, Laura Loomer tells Chris Gillen that she didn’t “think there’s another leak” that could have prompted the Wall Street Journal’s reporting. Big tech companies often face criticism for the opaqueness of their enforcement protocols for their community guidelines, a critique that conservatives have used as the foundation for a host of conspiracy theories—particularly in pro-Trump circles—claiming that their worldview is being eradicated from the internet through the engineering of algorithms. Those claims have gained so much traction that they’ve prompted hearings with tech executives on Capitol Hill. “The goal was that she was going to take this and then go on to Infowars or something and that we could make a bigger point about, ‘Look, a troll literally created a fake story and it got on Infowars. What does that say about these far-right propagandists and how the information in these news stories is created?’” Bernard said.